The lotus grows from the mud, rises through muddy water and appears clean and pure on the surface, finally producing a beautiful flower, symbol of enlightenment. 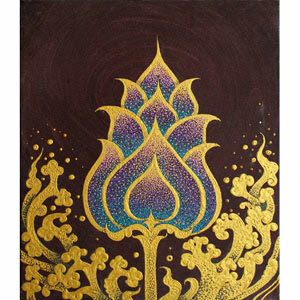 Thai artist Rawat Vongla depicts this phase of supreme enlightenment with acrylics. 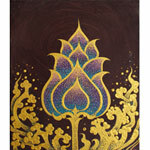 This item will be shipped stretched and unframed. Color discrepancies may occur between this item and your computer screen. This painting was made by Rawat Vongla. The artist was born in Udon Thani, in north-east Thailand. He studied Art and later Design. He graduated with a master degree from Rajamangala University of Technology in Chiang Mai. 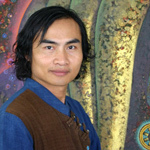 He has exhibited his artworks several times in Thailand and received 4 awards. ... Read Rawat's full biography on Ezistock Blog.